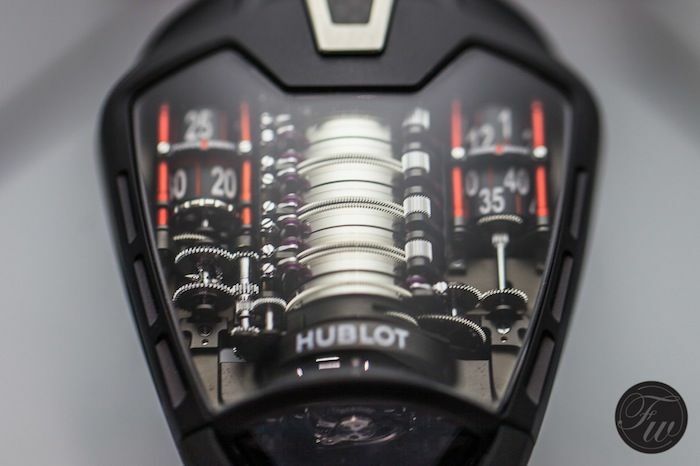 Today we’ve visited a number of brands, but one of the most impressive pieces was definitely the Hublot Masterpiece MP-05 “LaFerrari”. 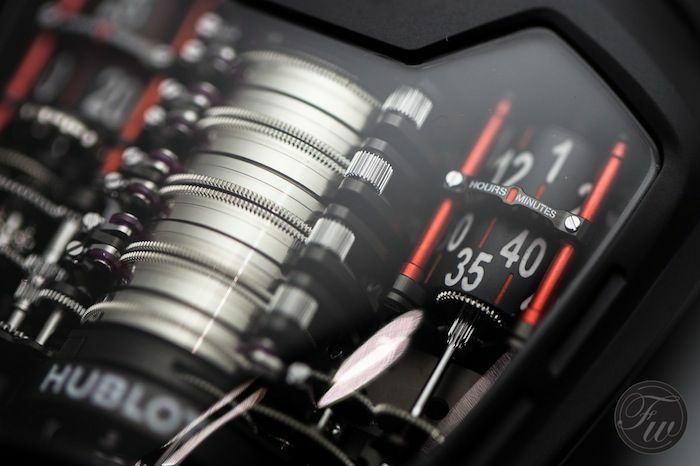 This watch is not only a tribute to the manufacturer of super cars from Maranello, it is also a watch that proves the watchmaking skills from Hublot. 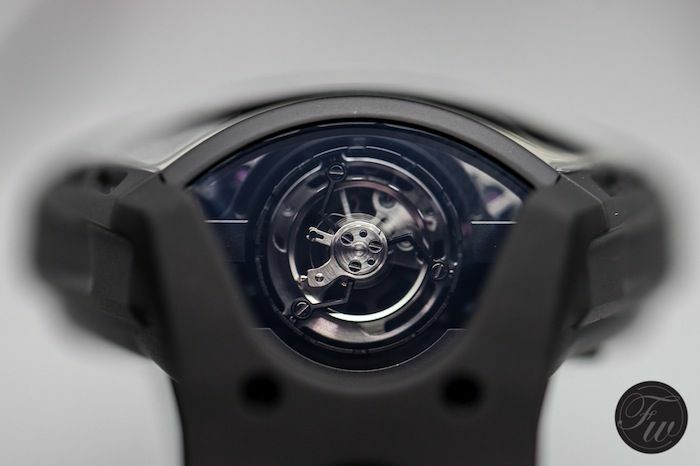 A power reserve of no less than 50 days due to its 11 barrels in the movement and a vertical tourbillon. The caliber HUB9005.H1.6 movement consists of 637 parts of which 108 are used for jewels. The large movement measures 45.8mm x 39.5mm. 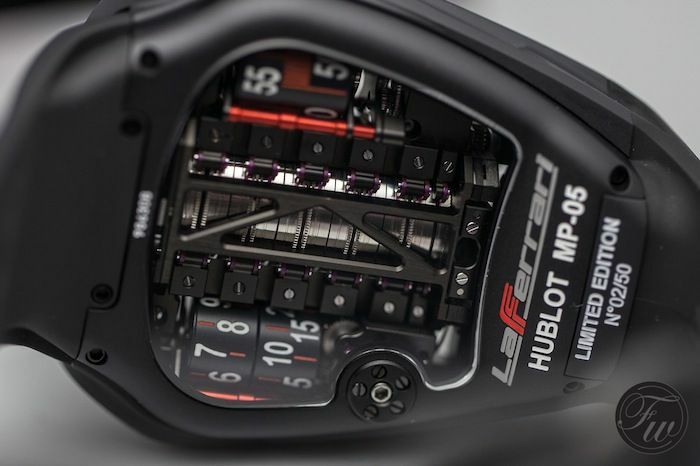 Hublot is producing this Masterpiece MP-05 “LaFerrari” in a series of 50 numbered pieces. Each with a price tag of 300,000 Swiss Francs (including VAT). You’ve probably seen some strange shaped watches before, we covered many here during the last 9 years on Fratellowatches. 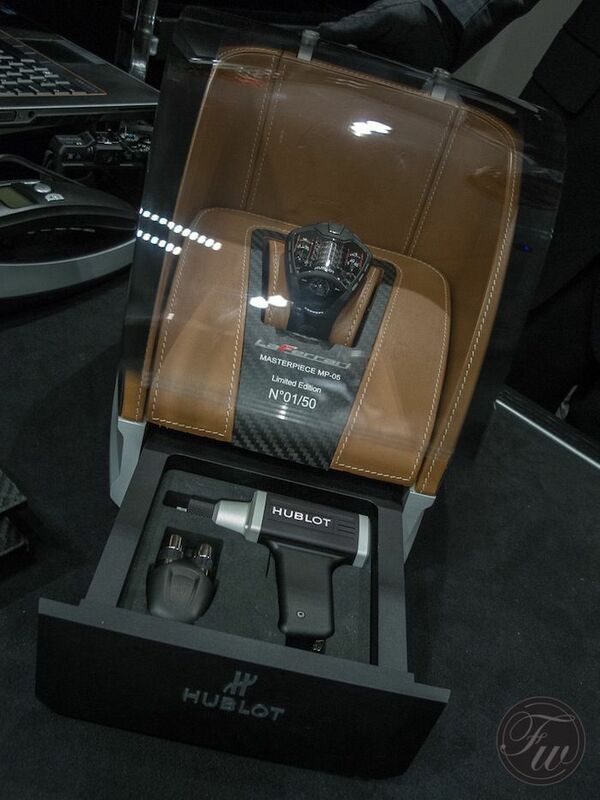 Hublot managed to create a watch with the same complex shape as the car has. 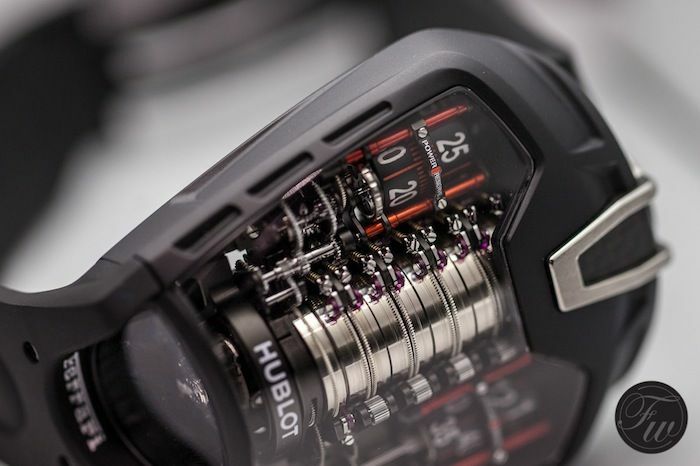 The open case-back is made from black PVD titanium and at 12 o’clock, you will find the winding crown surrounded by titanium and carbon parts. Also almost invisible is the time setting mechanism. The crown and time setting mechanism just blend in perfectly in the design of the watch. 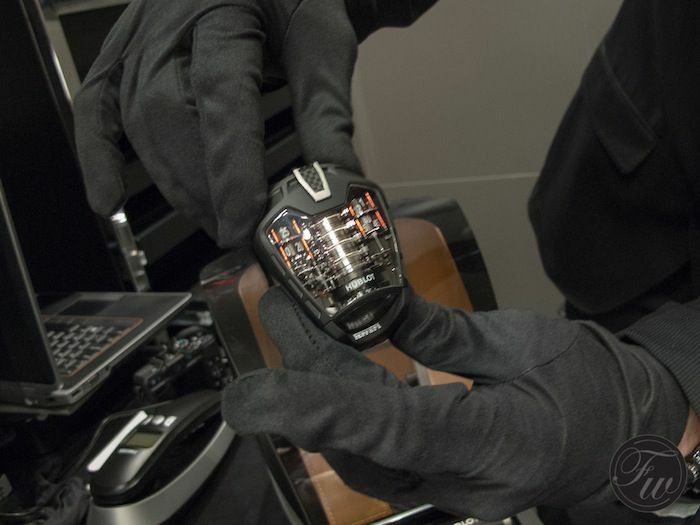 You might have to look closely when you first examine the Hublot ref. 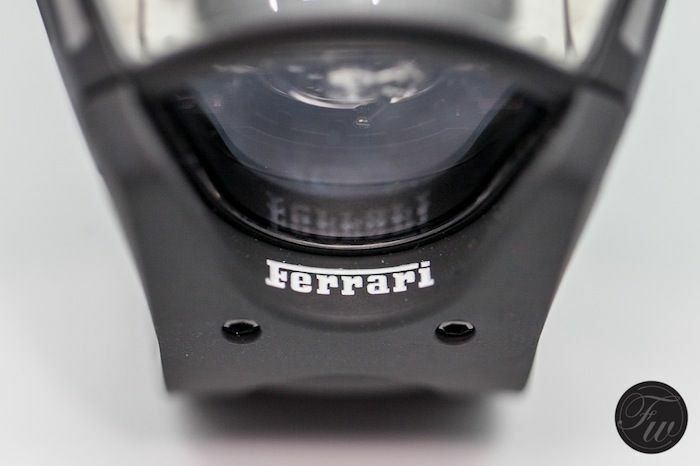 905.ND.0001.RX or Masterpiece MP-05 “LaFerrari” timepiece. 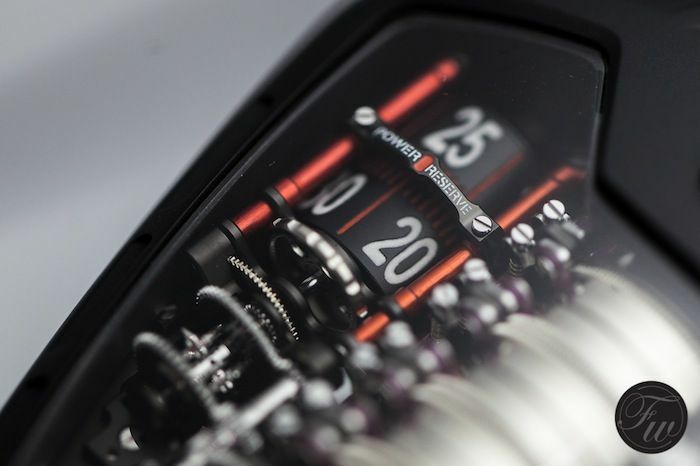 Let’s start with one of the key features of the watch, the 50 days of power reserve. On the left side of the barrels, you will find the power reserve indicator, showing you the remaining power left in the watch. On the right side of the barrels, you see the indication for hours and minutes. All the way below, at 6 o’clock, you will find the seconds indicator. 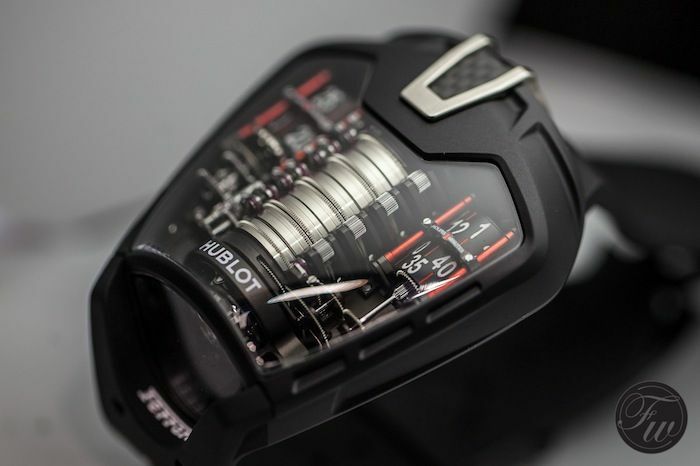 Both the power reserve indicator and hour and minutes indicators, Hublot made sure to make use of the famous Ferrari color. Red. 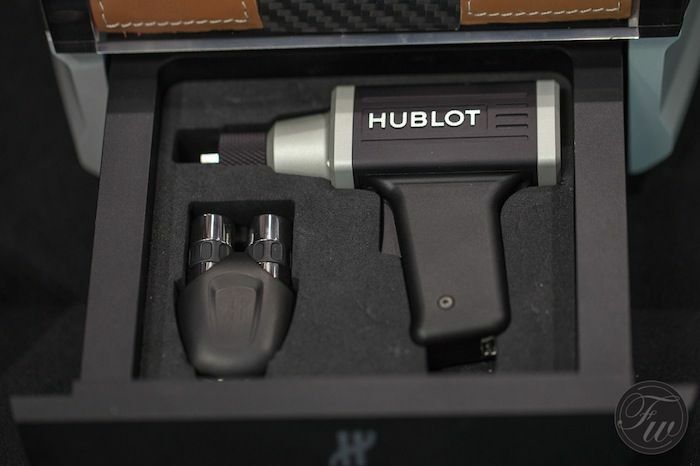 The Hublot Masterpiece MP-05 “LaFerrari” comes in a very special box. It even needs power to be operated (open and closed). The box also contains a small drawer with tools to wind the watch and set the hours and minutes.